For some reason a lot of the films this year were obsessed with the past. Whether it was the distant past or recent tragedies like 9/11, this year was all about it. Which is a cool thing, right? Mostly yes. But to be honest, I haven’t been this unenthusiastic about a year of nominees in a long while. Maybe since 2005. I was a big fan of the winner and I wanted it to win, so that was pretty cool. And I’d even go so far as to say that I liked most of the nominees. But … they were just kind of bland. Nothing we haven’t seen before. Not like 2010’s line-up of innovative films. You can’t be original every year though, which is why it’s ironic that the year’s most original movie was a throwback to the roots of cinema itself. So without further ado, here is yet another deluxe edition of my Oscar watch. Nine nominees people, prepare yourselves. 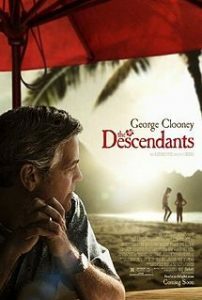 After all of that build-up, I didn’t particularly like The Descendants. I am really glad that Jim Rash, one of the writers, won an Oscar though. Solely for the reason that he’s on Community and now they can say “watch Oscar-winning actor Jim Rash on Community this Thursday at 8!” It’s the only reason I’m glad it won for Adapted Screenplay because the movie is mostly twaddle. The acting is good, but the characters are annoying. Both daughters did a great job of being snotty daughters but that doesn’t make it any less irksome. The film is basically about a man whose wife is in a coma and he’s trying to raise his two daughters without her and as it turns out she was cheating on him. And there’s something else about him having land that was left to him by his Hawaiian ancestors and whether he should sell it or not. I’m not sure what the pro/con list was for that land deal because the movie spends like two minutes on it. It seemed important though. So after much tedious family bickering which isn’t funny (was it supposed to be? No idea) he finally tracks down the guy that was sleeping with his wife. And it’s Shaggy. And Scooby-Doo was a while ago, because Shaggy got fat. So this woman was stepping out on George Clooney for fat Shaggy. Because that sort of thing happens. I’m sure it does, but as I’ve often mentioned: the movies have to be more realistic than real life. I don’t make the rules … but that’s one of them. Well as it turns out this guy only seduced her because of Clooney’s land claim. So what is the point of this movie exactly? It has all the makings of a great dark comedy. Except it isn’t funny. Most of it comes off as melodrama more than anything else. I was legit expecting to like this one too. Alexander Payne directed and I’m a fan of his other work. Plus one reviewer called it “a bit sitcom-y” so I figured the issue was that it was too goofy. As opposed to too stereotypical. Oh the one daughter has lost her way since her mom was in a coma! Oh the younger one might be going down the same path! Yawn. Continuing on this negative trend is Extremely Loud and Incredibly Close. My friend Andrew said he read one critic that postulated: “is this movie one of the worst ever to be nominated for Best Picture?” The answer is: quite possibly. It has a 40 perecent on Rotten Tomatoes … so that’s unusual. You may notice that the vast majority of the time I spend bashing movies is usually about the story or the themes or the acting or the style. Things that I’m not a personal fan of. This doesn’t necessarily mean that the movies are bad. It often means they shouldn’t have been nominated … but that’s different. This is legitimately not a very good movie. It’s not awful but it’s pretty bad. It’s sloppy and the premise is a thinly veiled “oh let’s mine people’s emotions by having it be about 9/11.” It is based on a book but that just means my issue is with the author. I could look up who that is but I don’t care enough. In the age of Wikipedia, that’s saying something. The movie is about this kid whose dad died in 9/11 and he (the dad) leaves him (the kid) a key that opens a lock somewhere in the city. Or a door. Or something. Because it’s feasible that a person could find said locked object in a city like New York. He does have a clue: the last name of Black. Of all of the surnames they picked Black. The kid literally has lines like “I found three Blacks today” “there are a lot of Blacks in New York City” and other eyebrow-raising phrases. They must have known this. Right? I just don’t know anymore. Anyway, the kid teams up with his grandfather (spoiler alert! That old guy is his grandfather) who has taken a vow of silence or something. Those parts were definitely the closest to being real scenes. The flashbacks with his dad (Tom Hanks) were good too at times. Their “oxymoron duel” was cute. But the movie is almost entirely about the kid, who is just super annoying. The old guy’s story is far more interesting. He never speaks in the movie. They just abandon his perceived character arc entirely. And of course the search for the lock is really just him coping with his dad dying and yadda yadda. The part at the end where his mom reveals that she’s been helping him along the whole time was nice. But the whole thing is just sloppy. Poorly constructed and overly done with too many similar scenes. The idea is interesting and maybe could’ve made a good short film but that’s about it. 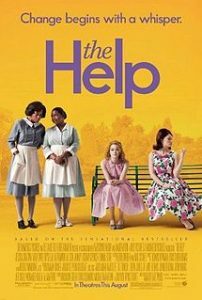 Right then, on to one I unexpectedly enjoyed: The Help. It’s Oscar bait and it’s manipulative but I still liked it. Mostly because it was intelligently done and well-acted. If it had won anything besides stuff for acting I would’ve been pissed. But it didn’t, and it was a popular movie and got nominated so that’s always pretty cool too. It’s basically about a young white girl writing a series of articles that reveal the struggles of the maids who work for her overly snooty neighborhood. All of the maids are black of course, as this was the still-racist ’60s in the South. The supporting roles definitely steal the show in this one. In fact, in addition to the Octavia Spencer/Jessica Chastain storyline being more enjoyable than the Emma Stone/Viola Davis one … I actually felt like they were in it more. I was surprised when Spencer was the Supporting Actress nominee and Davis was the Actress nominee. Emma Stone was an interesting character in a way, don’t get me wrong, but not as fun as Jessica Chastain. Not even a little. Stone’s character was kind of a Moses figure, which is something I wish they’d done more with. One of the main cruxes of the film is the idea that these maids raise the white children who then grow up to be their new masters. So Emma decides she wants to “free” them in a sense by making their voice heard. So … raised by slaves … wants to free them … doesn’t feel at home in her own society … see where I’m getting this Moses thing? It does come to fruition I suppose but she ends up sort of being the MacGuffin for the movie more than anything else. Still an interesting thought. The Octavia Spencer story is much more the “odd couple” type storyline, which has been a staple of the industry for a reason. It’s predictable but it’s fun. The chemistry between the two actresses was undeniable. Then it’ll switch over to Viola Davis and she’s just being kind of pouty the whole time. Boooooooring. Well-done … but still. The movie is a bit long for what it is but I definitely enjoyed it: once again proving I do indeed like stuff that I expected to hate (on occasion). 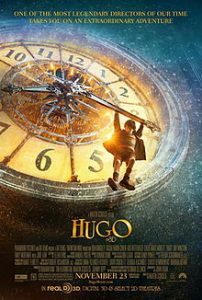 Easily my second favorite film of the nominees was Hugo. I was expecting to not like this movie up until the second I actually started watching it. All of the commercials made it look like a schlocky kids movie that’s little more than substance-less fun. And then I saw a clip on The Daily Show with a terrible special effect involving a wind-up mouse. Knowing Scorsese, it was probably intentionally odd-looking in the same way the blue peas were in 2004′s The Aviator (check my write-up, it’ll make sense) but it takes you out of the scene all the same. As it turns out: the movie is wonderful. It’s about a young orphan who meets the pioneering filmmaker Georges Méliés and helps to bring his work into the spotlight once more. But it’s about so much more than that. It’s about how the cynicism that followed World War I destroyed the idea of an escapist film. Well, destroyed it for a little while. This is not unlike the rampant cynicism that has been flooding our fiction since 9/11. It’s there, even if you don’t know it. I’m not saying this movie is about 9/11, so stop wondering! I’m just saying we’ve become a cynical society and this movie is asking us to believe in the magic of dreaming again. As though we were wide-eyed children like Hugo and his ladyfriend (significantly more charming, yet less badass, than she was as Hit Girl in Kickass). I had the privilege of seeing many of the films portrayed within this movie and so it was nice to see them be “mainstream” even if they were just clips. So basically: it’s every bit the schmaltzy movie that it looks like. It’s just one that I happen to like. This is also largely due to the fact that the film doesn’t focus nearly as much on the relationship between Hugo and Méliés as the trailer implied. Because that whole “kid in need of a father-figure, old guy in need of a son-figure” schtick is dead now because Up did it perfectly. It was more about the relationship between the kids. And Hugo brings Méliés back from “the edge” if you will, but it’s in a more understated and effective way than it would have been in the hands of a lesser director. Nowhere in that description is there a mention of time-travel or the meeting of amazing artistic minds from the early 20th Century. Umm … why? Not only is that basically the whole movie, that’s pretty cool! How many movies say that they’re about a couple examining their relationship? Every Kate Hudson, Kristen Bell, and Julia Roberts movie. Times 47. 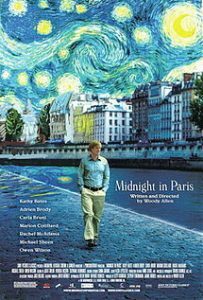 How about a delightful movie about a writer who gets to travel back in time and meet people like Ernest Hemingway, F. Scott Fitzgerald and Salvador Dalí? Not nearly enough of those around. In true Woody Allen fashion, the time travel is never explained. Nor should it be. It is a comedy after all, not a laugh-out-loud one but a fun one. The dialogue is fresh and the actors deliver it well. A true ensemble performance. Great actors like Adrien Brody stop in for like two minutes, which shows you the type of gravitas Woody Allen brings with him. Don’t tell anyone, but I’m kind of a hopeless romantic. You have to earn it with me though. Which is good because otherwise I’d probably like chick flicks. This is an intellectual’s (and yes: snob’s. I’ll say it) romantic film and it definitely worked its magic on me. 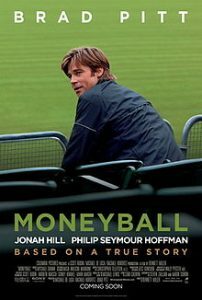 A movie I was less enthusiastic about but still liked is Moneyball. After admitting my hopeless romanticism in the last paragraph I probably shouldn’t mention that I like Brad Pitt in pretty much anything. But … I like Brad Pitt in pretty much anything. I used to think he was a useless prettyboy. And then I saw Fight Club. And Se7en. And like a million other things. The dude is legit. It also taps into the inherent meaninglessness of the whole sports scene. And yet, how that makes it meaningful. You’d expect such a thing from a movie co-written by Aaron Sorkin. I’ve said it before, that man has so much talent that it’s literally disgusting. I want to punch him in the face and then beg him to teach me his ways. I can tell a lot of the lines of dialogue within the movie that are his because his style is unmistakable. That’s the main highlight. The story itself is mostly like every other sports movie, except that they don’t win the championship of course. They do point out that the money-saving technique described in the movie was used by the 2004 World-Series-winning Red Sox, so that was pretty cool. One of my friends did point out that if you’re not a baseball fan then you probably have no reason to like this movie. That’s probably true. I am a fan so it’s hard for me to say for sure. But that’s probably accurate. It’s also a little overly long and the tones are kind of all over the place. I definitely enjoyed it for what it was though. Not a life-changing movie by any means but a good one. Now we come to the movie I have the most and the least to say about: The Tree of Life. W.T.F. That’s all I have to say. I don’t know if I liked this movie or hated it. I don’t know if it’s good or not. I don’t know who I am anymore after I watched it. I will say this: it held my attention more than any film has in a long time. Because I was mesmerized by it. Not even in a good way. Not remotely in a good way. In a fascinated way? Perhaps. I want no one to suffer through this movie and want everyone I know to watch it, just in case we can figure out what it means sometime before those infinite monkeys write “Macbeth.” It’s supposed to be about a boy who loses his innocence (not in a Mrs. Robinson way, in a Colonel Kurtz way) after the death of his brother. What it’s actually about is a bunch of quasi-philosophical jargon that’s offset by some admittedly beautiful cinematography and then there’s a 20 minute sequence about the beginning of the universe. Sean Penn is in it and doesn’t talk. Jessica Chastain is in it and floats. Dinosaurs are in it without Jeff Goldblum. W.T.F. There’s hardly even a complete sentence for 45 minutes. The middle portion, which is more coherent, is actually pretty good. It deals with the boy’s relationship with his father (Brad Pitt, who’s everywhere) and is actually a fascinating character study in many ways. Too bad most of the audience is already asleep. Sean Penn himself (who, I take it back, has one line of dialogue in narration) said that when he read the script it was the best he’d ever seen … but that’s not indicative of the film. Terrence Malick is notorious for being weird and also for filming like four hours worth of movie. The fact that any bit of it can be cut out without detracting from the overall point is very telling. I feel like there was a lot more with the boy when he grows up to be Sean Penn. Or perhaps there was just more floating. Lots of fascinating things at play to be sure. And I actually would like to watch it again someday with some other seasoned film veterans. But it makes 2001 look like it has the over-coherence of a CBS crime drama. 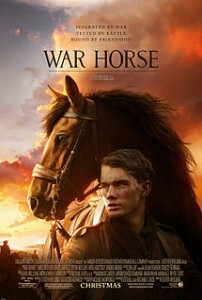 Almost the complete opposite of that movie is War Horse. It’s basically every easily digestible 1950s movie you’ve ever seen. Except prettier. It’s definitely beautifully filmed and John Williams, as always, delivers an incredibly beautiful music score. It’s very problematic as a movie though. The only main character is the horse … and it’s not a Pixar horse so it doesn’t really work. There’s no one you can really connect with, which is unfortunate because even when I thought the whole movie was the boy and his horse I knew it’d have issues. 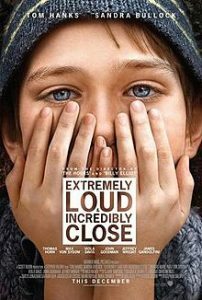 It’s pretty blatantly a movie that’s trying to make you cry, and not exactly for much reason,which is fine but it kind of bothers me on a fundamental level. But it’s not even that. Different actors and characters fade in and out of the movie and so you have no one to relate to. You care about the horse immediately and you want to see him survive. But A) it’s not really a character, as pretty as it is and B) you know he’ll survive so the driving force of the movie is a foregone conclusion. The boy does get reunited with his horse and it’s all very nice but I’d have liked it much better if we saw what the boy was up to the whole time. Don’t get me wrong, the movie has some stunning cinematography and some truly breathtaking scenes. It’ll make you cry and it’ll swell your heart, just as promised. And the horse is undeniably awesome. But I guess I was expecting a bit more from Spielberg, especially since he doesn’t make as many movies nowadays. Definitely worth watching, but not quite as good as I was hoping. 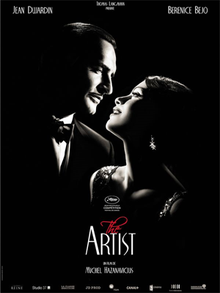 And now the ever-elusive film that I wanted to win … and is also this year’s winner: The Artist. Overall, this year wasn’t very impressive for films. So it was a great year for this little gem to sneak in and snag the Best Picture award. It’s the first true silent film in a long, long time. I say that because Mel Brooks’ 1970s spoof doesn’t really count. In a year where every movie was looking back, this film was looking forward. It sounds strange but it’s true. It’s about a silent film star who is dealing with his increasingly obsolete career in the face of the invention of talking films. It’s all done in a completely delightful and fun way, but that’s the underlying theme. He’s trying to hang onto the past; no matter how increasingly irrational that goal is. He soon meets a young actress and they are quite smitten with each other, but she becomes a rival of his when she begins to headline a lot of “talkies” (as they called them). Eventually he decides that he cares more about her than he does about his “legacy” as he thought it would be. The film ends with the uplifting thought that he’ll have a successful second career, which not every silent screen actor was given. That’s pretty much the whole movie. Quite simple. Also quite enchanting. As my friend Andrew pointed out (maybe he should have his own blog, I’ve stolen enough of his ideas today): Hugo told us why we should care about old movies but The Artist showed us why. It is both a love letter to silent films and a subtle spoof of them. There are lots of little moments that play with the genre (if you can call it that), such as someone moving their lips a lot with the caption “yes” or someone mumbling briefly followed by a large paragraph. There was also a brilliant misdirect that had to do with the imaginary sound effects of silent movies. And of course … I’m a sucker for dream sequences and this movie has a nightmare sequence about the onset of sound in the movies that is simple stunning. I can’t recommend the film enough, it’s obviously not the most innovative or incredible movie of all time but it is a supreme delight and it’s hard for me to imagine anyone not liking it. I’d like to think that when the Academy Awards began in 1927, that was the only criteria required for a Best Picture win. Well that’s it for this year. Now my blog is going to go hide in obscurity for another year. For you persistent readers: my 1947 entry should be up in a week and a half or so. Depending on how quickly I feel like sitting through some intense dramas involving a lot of anti-anti-semitism. Good stuff … but rough I’m sure. For the rest of you: I’ll see you in 2013 for next year’s Oscar round-up! Avengers, anyone? Doubtful. But one can hope.